But the genuine small town provincial welcome and hospitality was extended to me, a total stranger, before we even figured out a common link. Ronald Villanueva is the municipal budget officer and ICT Officer (this will be relevant later in the post) and he was checking in on one of his children in a class playing in the shadows of the bell tower. He showed us into the bell tower which also served as a prison on the first floor, complete with wall etchings/drawings counting the days someone had been incarcerated. Marred by recent graffiti, it was still a very impressive reminder of your fate if you did something wrong a hundred or more years ago. A light airy cell, it was, nevertheless a cell. Speaking of graffiti, if I were ever supreme leader for a day, my punishment for those caught defacing private and public property with useless grafitti would be for the owners of the defaced property or in the case of national treasures, an appointed person, to be allowed to tatoo graffiti all over the faces of the perpetrators… so that the rest of their life they would have someone else’s name, expletive, wacky drawing or strange cursive writing all over the face. So there. 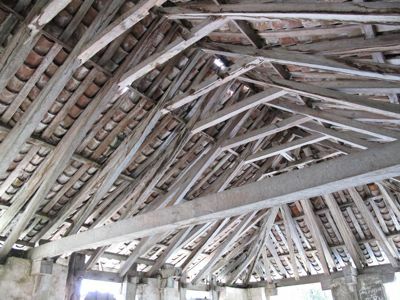 A frame of beams and trusses in hardwood held up hundreds of large clay tiles made from materials in the area. 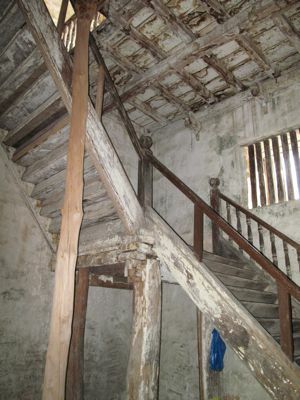 This roof, if I understood it correctly, had survived the test of time, the vagaries of storms and typhoons coming full force from the sea, for some 150+ years! It was fascinating to spy the interlocking tiles which appear to have been just laid on top of each other without cement or mortar holding them together. I was so fascinated I spent several minutes looking up, wondering if I could have a small hut or lanai made the same way… it was cool, literally, and very cool, figuratively. The bells (there were three or four, I think) were the main attraction in this building and we were actually allowed to ring them on this visit. Some were dated and go back 130+ years. The view from this vantage point, albeit just 5-7 meters up, was spectacular and you can see the entire cove in front of Boljoon. It is here that the story has a wonderful modern twist. Ronald and other more progressive and technologically inclined citizens of Boljoon fought for, and finally installed a wifi system just in front of the church. I know, it sounds utterly bizarre, and when I saw the sign, I whipped out my ipod touch to see if I could check into marketmanila.com, but it seems there was a brown-out at that precise hour! Why wifi? It seems that the children of many OFW’s from the area were now becoming computer literate, and as their arents have visited over the past couple of years, they requested laptops (now more closely priced to fancy cellphones) instead of other doodads, and now, on a late afternoon, several citizens from the town are seen linking up to say hello to their parents and surf the net while sitting in the plaza or looking out at the ocean. Amazing. This is 150 kilometers or so south of Cebu, and there aren’t even internet cafes around here, and the nearest Jollibee is an hour North in Carcar and instead there is a free-for-all town sponsored wifi system. I was pleasantly shocked and smiling from ear to ear. Good on you, guys from Boljoon. That is just wonderful. Just wonderful. :) Now if only the folks in National government were as caring and intelligent and service oriented as the folks from this little town in Southern Cebu. The bells are stunning. They survive the sea breeze without much deterioration on them. High rise ceiling gives extra beauty and comfort to a building. I guess thatâ€™s how they conceived cathedral ceiling in residential houses to shield the interior of the house from the burning sun and eliminate noise. The wood they used in the old days is 50 times stronger than the wood available now. I guess due to early harvesting susceptible to dry rot and termites. Wifi is part of the modern marvel to reach and touch your loves ones shores apart. this whole post took my breath away. thanks, MM. Loved your last photo. Is that their plaza over there? Simple yet lovely. And I see greens everywhere. Kalami mupuyo and make it a weekend home. Wi-fi! Yeah baby! 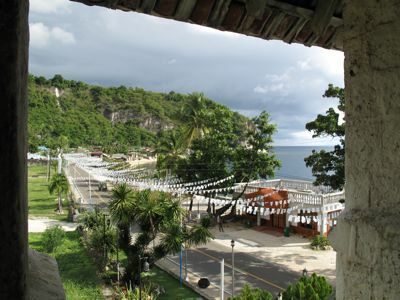 For a town so remote as the nearest Jollibee is an hour away, the folks at Boljoon sure know good investments! I could live here! Really. I’ll just have my office email me my workload! i love these last 2 posts,MM—-those bells and the old church are marvelous! great people of Boljoon is the reason of having a great and amazing town. having been connected to travel industry before let me experienced to travel 95% of the country….and 1 thing is very sure we have a lot of places to see and enjoy in are own land. Ronald, thank YOU for being such a gracious and impromptu host and tour guide during our brief, unexpected and previously unplanned trip to Boljoon. And as for the WIFI project, I really think it was brilliant and I hope more towns do that! The structure featured above is a blockhouse. Its original use was for defense purpose when Boljoon was under constant threat from marauders and pirates from the South in the 1700â€™s. Artilleries were supposed to be placed in the openings where the bells are hanging now. Without such defense, Cebu or the whole of Visayas may have been under the influence of Islam. Sad to note, this piece of history is never mentioned in our history books. The picture of the school children (and the dog!) playing by the shadow of the Bell tower says it all!! Its more than an Amorsolo painting….priceless!! Wow MM…your posts are truly inspiring! Makes me appreciate our country more. The landscape looks so simple yet leaves you breathless. Your photos are wonderful!! I wouldn’t mind retiring there. Many times,simple lives are all we really need. As our children move away,I realize we need less than what we used to have. I truly thank God for the gift of your posts. Inspiring. How beautiful! I especially love the picture of the children and the last photo. 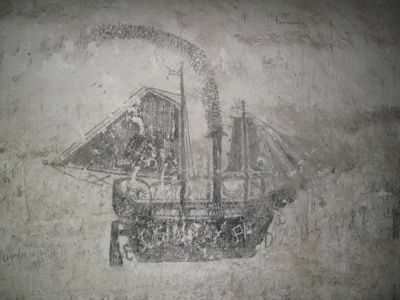 The picture of the ship drawing made me think of The Count of Monte Cristo for some reason. Imagining that the prisoner was a sailor who might have seen this as an emblem of his freedom. 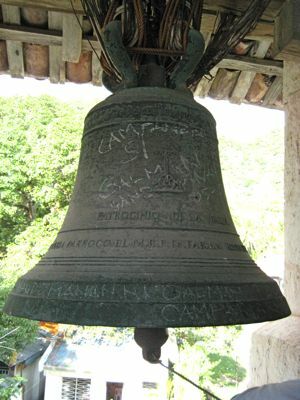 What saddened me was seeing the crude carvings on the bell, argh! 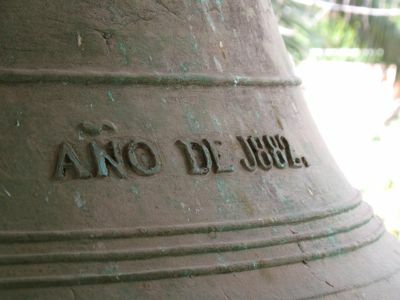 I visited a lot of bell towers in Ilocos some years back during a trip around the province, and so many of them are defaced and in need of major restoration. The graffiti is just a sign of how rude people are, it’s a church for goodness sake! Boljoon is such a quaint town. Staying there just takes away the stress of city life. I should know. The town has been practically home to me in the years 1990-1998. Your pictures are simply amazing. And thank God, you had Ronald for a guide. 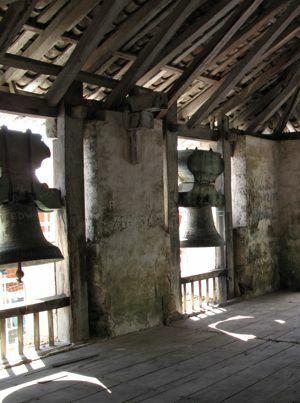 The belfry is the best vantage point to watch out for invaders coming from the sea in the old days. If accessible to visitors today, this is also the best place to have a bird’s eyeview of a town we’re visiting for the first time. I remember doing this in a town near Iloilo and barring vertigo, it was a unique experience. The WFI project of the townspeople just goes to show that we don’t need ZTE-type broadband deals which just become a source of corruption for many people. Natie, I saw your comment belatedly. Yes, Miag-ao is the church we visited in Iloilo with a breathtaking view from the belfry. Wow, I’m impressed! For a small and remote town to think of a wifi project, that’s pretty amazing. Congratulations to Ronald and the people of Boljoon. Wow, the people of Boljoon surely has the motivation. Congrats to you guys! This reminded me of the article in Inquirer wherein my former teacher and his colleagues helped install a Wi-Fi antenna in Batanes so that the students can learn more about things in general. With this technology, not only the OFWs of Boljoon and their children can benefit, but also the students, visitors (like MM) and everyone else as well. If this church is in singapore,thailand,vietnam or hongkong it will already be listed as national heritage and one of a great place to visit. Luckily we still have a few guys like Ronald who help o restore it to it’s glory. If I ever visit cebu i’ll definitely want to see this place. Will show these photos to my mom! They wills surely bring back fond memories for her. Thanks, MM! kanindot gyud sa boljoon.. oi..
aside sa mga namention ni sir ronald nga site..
thanks mabuhay ka boljoon!!! weeee!! !